Well how could I pass up this adorable little craft? Back in February, I had the opportunity to make a pair of these fun gifts: one for my cousin Katie and the other for our friend Brendan. I hit up Costco for the 100 count box of Blwow Pops figuring I will have another opportunity to make a third sometime in the near future. I got the containers for Christmas Tree Shop and Target I believe. The styrofoam was recycled from a Christmas gift. I started the first one using only the pin's photo as a reference. I carved up the foam and hot glued it in. I then started sticking the pops in, using the method I learned back in my Flowershop days. Its hard to explain, but you put one in the top sticking straight up, then one in the middle of each side near the container. Next, another 4 go in between the bottom row and top lollipop. Then I just started filling in the holes. I encountered an issue by not reading the directions: I didn't think to cover the styrofoam before I added the pops. As a result, you could still see it through the sticks. See the white styrofoam peaking through there? My solution was to wrap some raffia ribbon I had in and around the sticks to add some texture and sort of distract from the visible foam. You can still see some of the foam but I think it helped. Lastly, I printed out some quick labels made powerpoint and used my Creative Memories circle cutters (circa 2001 and still going!) to cut them out. A wooden skewer and some tape and it was done. A little plastic wrap and some curling ribbon and it was ready to be gifted! For the second one, I learned my lesson. 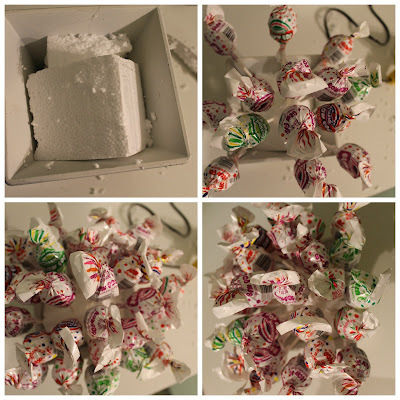 I wrapped some colorful tissue paper around the styrofoam before inserting all the lollipops. I also made the label a little smaller on this one (the first one was a little bit obnoxious). Both Katie and Brendan seemed to enjoy them. They were pretty easy to make and fun to give. 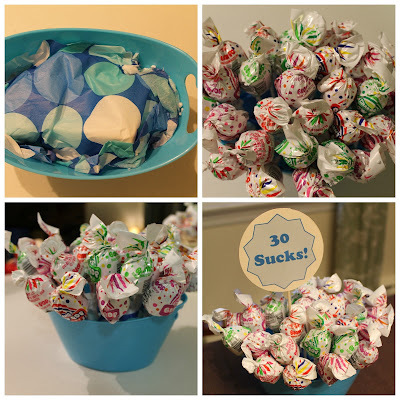 You could definitely dress them up some more, maybe with some colorful pipe cleaners curled up and added in between the lollipops. Or add some lottery tickets tucked in there. 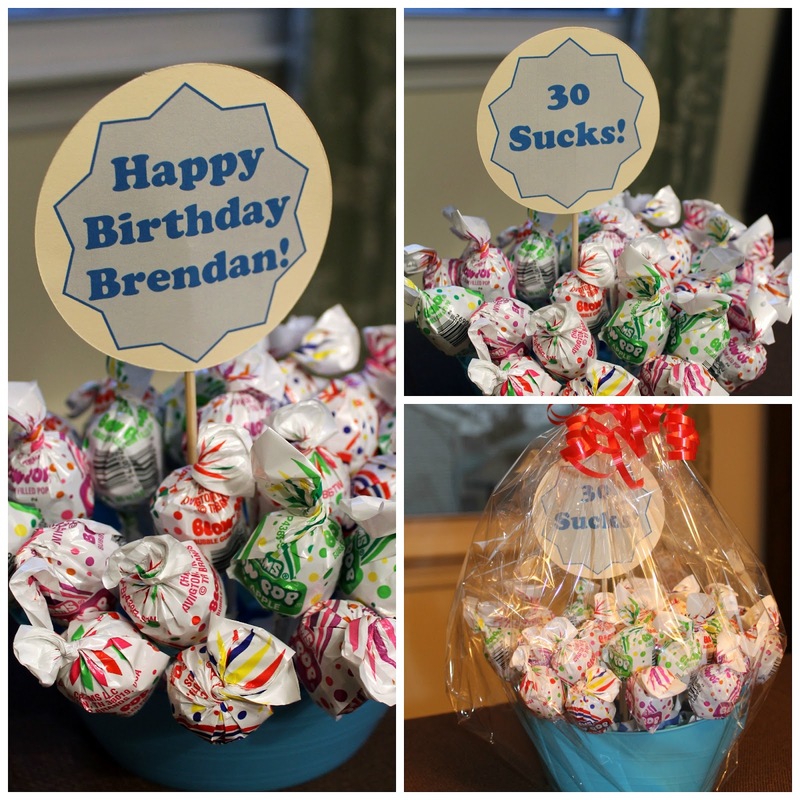 Anyone else out there have any creative 30th birthday gifts? I think Joe could use some help since every time he asks me what I want I change the subject - denial in full force!